From a carved mammoth tusk (ca. 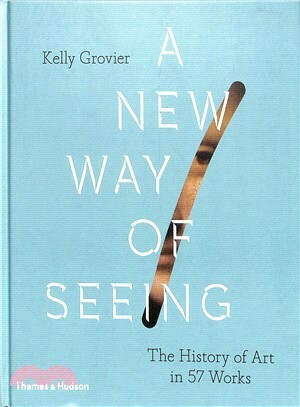 40,000 BCE) to Bosch’s Garden of Earthly Delights (1505–1510) to Duchamp’s Fountain (1917), a remarkable lexicon of astonishing imagery has imprinted itself onto the cultural consciousness of the past 40,000 years.Author Kelly Grovier devotes himself to illuminating these and more than fifty other seminal works in this radical new history of art. Stepping away from biography, style, and the chronology of “isms” that preoccupies most of art history, A New Way of Seeing invites a new interaction with art, one in which we learn from the artworks and not just about them. Grovier identifies that part of the artwork that bridges the divide between art and life and elevates its value beyond the visual to the vital. This book challenges the sensibility that conceives of artists as brands and the works they create as nothing more than material commodities to hoard, hide, and flip for profit.Lavishly illustrated with many of the most breathtaking and enduring artworks ever created, Kelly Grovier casts fresh light on these famous works by daring to isolate a single, and often overlooked, detail responsible for its greatness and power to move. From a carved mammoth tusk (c. 40,000 bce) to Duchamp’s Fountain (1917), and Bosch’s Garden of Earthly Delights (1505–10) to Louise Bourgeois’s Maman (1999), a remarkable lexicon of astonishing imagery has imprinted itself onto cultural consciousness over the past 40,000 years – a resilient visual vocabulary whose meaning has proved elastic and endlessly renewable from era to era. It is to these works that Kelly Grovier devotes himself in this radical new art history. Stepping away from biography, style and the chronology of ‘isms’ that preoccupies most art history to focus on the artworks themselves, Grovier tells a new story in which we learn from the artworks, not just about them. Looking closely at each work, he identifies an ‘eye-hook’ – the part of the artwork that ‘bridges the divide between art and life, giving it palpable purpose and elevating its value beyond the visual to the vital’ – and encourages us to squint through this narrow aperture to perceive the work’s truest meanings. This book is unique in emphasizing the durability of what is made over the ephemerality of its making and serves as a rejoinder to a growing sensibility that conceives of artists as brands and the works they create as nothing more than material commodities to hoard, hide, and flip for profit. Lavishly illustrated with many of the most breathtaking and enduring artworks ever created, as well as many that inspired or took inspiration from them, this refreshing book will spark a debate about how it is that artworks articulate who we are and what it means to be alive in the world.